University of Southern Maine President Theodora Kalikow in March 2014. 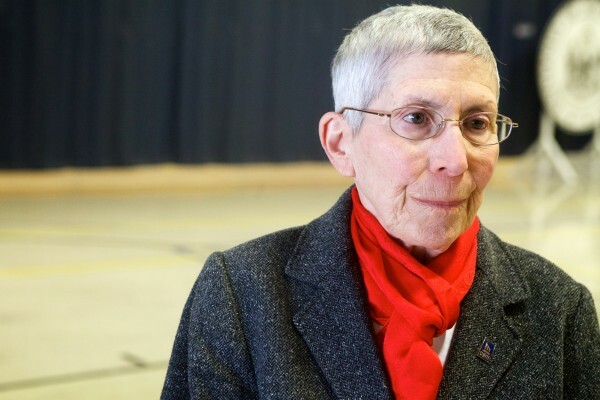 PORTLAND, Maine — University of Southern Maine President Theodora Kalikow announced Friday the final phase of cuts needed to pass a balanced fiscal year 2015 budget, though more cuts are expected in the coming years. The bulk of the savings — $1.56 million — will come from 16 faculty retirements and one staff layoff. Another $483,000 will come out of a fund that is usually used to invest in new positions and $446,000 will come from a reduction in spending on energy, equipment replacements, research awards and external consultants, according to an email Kalikow sent to campus employees. Kalikow said the university is anticipating cutting $12.5 million next year in order to pass a balanced fiscal year 2016 budget. “We will, as a community, continue to make hard choices that position this university for the future and provide a first-class, affordable education for our students,” wrote Kalikow. The elimination of three USM programs — American and New England studies, arts and humanities at the Lewiston-Auburn campus, and geosciences — will go forward, she said. Last month, the University of Maine System’s board of trustees voted to pass a $529 million budget for fiscal year 2015 that cut 157 jobs and pulled $11.7 million from the system’s rainy day fund for the first time since the fund’s creation. The budget accounts for $22.7 million worth of cuts that were made across all seven of the system’s universities. Presidents and financial administrators worked with the system office throughout the year to figure out where to make those cuts. UMS administrators have said that the cuts are an effort to mitigate a systemic budget shortfall caused by flat funding from the state and frozen in-state tuition rates, paired with rising costs and a declining student population in Maine. Last fall, the board of trustees was presented with the fact that if the system did not make changes, it would be up to $90 million in debt by fiscal year 2019, according to system documents. USM was tasked with finding $14 million in savings this year, or about 10 percent of its budget. When the budget passed, $2.5 million of USM’s cuts had yet to be determined because the administration decided to give the faculty a chance to weigh in. In March, 12 faculty members received notice that they would be laid off as part of Kalikow’s plan to cut USM’s budget. Students and faculty responded by organizing rallies and engaging lawmakers in an effort to reverse the cuts. At a Faculty Senate meeting in April, Kalikow announced the 12 faculty layoffs would be rescinded and implored the faculty to come up with an alternative plan to find the savings. Members of the Faculty Senate presented their alternative plan in late May, which included $1.6 million in administrator compensation cuts and $2.1 million in voluntary early retirements from faculty members. Kalikow said Friday that some of the faculty’s recommendations were accepted, including the retirements, though not all those savings would be realized in fiscal year 2015. Other recommendations could not be implemented immediately and would be considered in the coming years, she said. Now, Kalikow will go to the UMS board of trustees for approval of this most recent proposal of cuts. She will send her proposal to the trustees on Monday, she said.